Marble Relief Sculpture, Hellenistic Roman Art, Greek-Style Frieze. In its new museum in Rome.  What is the Ara Pacis Augustae? Senate in the Processional Frieze. What is the Ara Pacis Augustae? An unusually muted form of triumphal Roman architecture, but one of the greatest examples of early Roman sculpture, the Ara Pacis Augustae (Latin for "Altar of Augustan Peace") consists of a stone table of sacrifice within a walled precinct, whose walls are pierced by entrances on the east and west. The outer sides of its four walls are carved with relief sculpture and all the sculptured sections of the monument are made from Luna marble. The shrine was inaugurated by the Roman Senate in 13 BCE, to mark the triumphal return of Emperor Caesar Augustus (ruled 31 BCE - 14 CE, as emperor from 27 BCE) from the battlefields of Gaul and Spain, and finally consecrated in 9 BCE. The iconography of its sculpture was designed to celebrate the peace imposed by Augustus throughout the Empire, and like all Roman art, was intended to be a visual reminder of Roman military power and of the Julio-Claudian dynasty by whom it was established. The altar was erected in the northeastern corner of the Campus Martius, an area cleared by Augustus to hold several monuments. Although the identity of its creators is not known, one must suppose that they included the best sculptors of Ancient Rome, though ones highly familiar with Greek traditions of stone sculpture. Over the centuries, this unique item of plastic art became covered with silt from the River Tiber, and remained undetected for fifteen centuries, until 1568. After various attempts at excavation, in 1859 and 1903, the altar was fully raised in 1938 by Benito Mussolini who relocated it in its own building near the Mausoleum of Augustus as part of his attempt to create an ancient Roman "theme park". The Ara Pacis is now housed in a new and highly controversial building, designed by the contemporary American architect Richard Meier, which opened in 2006, on the same site. The shrine stands inside a small precinct. The outer walls are decorated with some of the finest relief sculpture of Ancient Rome created during the Augustan era, all sculpted in white marble. They show the altar's dedication ceremonies, featuring scenes of traditional Roman piety, in which Augustus and his family - along with numerous other figures - were shown offering sacrifices to the gods. As usual, themes of civil order mix with those linked to the policies of Augustus himself. In addition, there are scenes taken from Roman mythology and some floral motifs. Unlike the more idealized, neutral types seen in earlier Greek sculpture - even during the recent period of Hellenistic Greek sculpture, which had ended only 36 years previously - the figures sculpted for the Ara Pacis, notably the life-sized figures in the dedication procession on the North face, are recognizable portraits of actual individuals. The main inspiration for the understated, consciously cool and static majesty of the Ara Pacis processional reliefs, is High Classical Greek sculpture, from the era of the Parthenon and other monuments. (See also: Greek Architecture.) The main influence for the altar's mythological sculptures appears to be Hellenistic statues and reliefs. (For another example of Hellenistic-style reliefs, see: the Pergamon Altar of Zeus (c.166-156 BCE). (But see also the new form of expressiveness adopted by the Pergamene School of Hellenistic Sculpture: 241-133 BCE). In its interweaving of Roman power politics with the city's legendary past, of concrete fact with symbolism and allegory, of classical dignity in the human figures with a delight in nature in the decorative friezes, the marble sculpture of the Ara Pacis Augustae is simply unequalled in the history of sculpture of the early Roman period. NOTE: For later artists and styles inspired by the classical sculpture of ancient Rome, see: Classicism in Art (800 onwards). 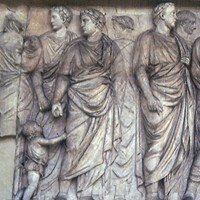 The iconography of the North Face of the Ara Pacis features pictures of the inaugural procession which took place in 13 BCE. The figures include Augustus, his adoptive son and successor Tiberius (ruled 14-37 CE), consuls, lictors with their bundles of rods symbolizing Roman authority, priests from the college of the Septemviri epulones, and members of the collegium of the quindecimviri sacris faciundis. The final group consists of the royal family hierarchically organized by familial rank. The leading figure is either Julia, Augustus's daughter, or his sister Octavia Minor. Other known individuals in the family group include Marcella (daughter of Octavia), and Iullus Antonius (son of Mark Antony), as well as three younger figures, two boys and a girl, variously identified as Gaius and Lucius Caesar, Ptolemy of Mauretania, a German boy and a Parthian prince. The much debated South Face of the Ara Pacis Augustae contains a number of recognizable figures, but the identities of several remain in dispute. The sculpture of Augustus, recognizable by his hair, went undiscovered until 1903, but is now fully accepted by all scholars. The sculpture of Agrippa, similar to other reliefs of Agrippa in the Ny Carlsberg Glyptotek (Copenhagen), and the Louvre (Paris), is also agreed on by a majority. The same goes for the figure of Tiberius, whose facial features resemble those of other Tiberius sculptures. Other identified reliefs include that of Antonia (Augustus's niece), Drusus (Livia's son from her earlier marriage), and their 2-year old son Germanicus. The most contentious figure is that of either Julia (Agrippa's wife) or Livia Drusilla (Augustus's wife). Julia, already the mother of four children, was associated with the Emperor's new fertility program, and thus would be an obvious candidate for inclusion, though not perhaps at the expense of the Emperor's wife: one reason why a slim majority favours the latter. The East and West Faces of the Ara Pacis each have two relief panels: one of which is in good condition, while the other is badly preserved and barely decipherable. On the East Wall, the better preserved panel depicts a Goddess sitting with twins, surrounded by a scene of fertility and well being. Although art historians are still not sure whether she is supposed to be Italia, Venus, Tellus or Peace, they agree that the overall composition represents Pax Augusta - the peace imposed by the Emperor. The more fragmentary panel features the female warrior Roma (recognized from similar poses on coins), sitting atop a heap of captured weapons: the inference being that she is forcing her enemies to make peace, another clear reference to the Pax Augusta and the Emperor's military victories. On the West Wall, the better preserved panel portrays the sacrifice of a pig - a Roman custom following a peace treaty. Interpretations of the scene vary. One, proposed as early as 1907 by the scholar Johannes Sieveking, suggests it illustrates the arrival in Italy of Aeneas - the mythical hero of Troy and Rome - when, according to Virgil, he sacrificed a pig and her piglets to the chief Goddess Juno. Another more modern interpretation, by Paul Richardson, is that the scene involves Numa Pompilius, the earlier King of Rome who was associated with Peace and the Gates of Janus. In addition to the figurative sculpture listed above, the lower zone of all four outer walls is decorated with a pattern of floral relief work also featuring a host of tiny beasts, birds, and insects. Inside the precinct, the upper zone of the inner walls are decorated with large patches of fruit, leaves, corn, ears, and the like. Most of this decorative art resembles carvings from second century BCE Pergamon in Greek-controlled Asia Minor - home of the great Pergamon Zeus Altar - and some first-century BCE sculpture from Attica in eastern Greece.  For more about Roman sculpture, see: Homepage.